Thomas was an active Tory in the Revolutionary War. David Fanning, commissioned colonel of the Loyal Militia by the British, organized his regiment July 16, 1781. Thomas "Estrich" was ensign of one of the two Orange county companies. September 14, 1781, Ensign Thomas Estrich was promoted to Captain in his company. their own [Kings Mountain, SC in Oct, 1780 and Cowpens in Jan. 1781]. Patriot leaders such as, Francis Marion "The Swamp Fox", Thomas Sumter, and Nathaniel Greene were active in the Carolinas. 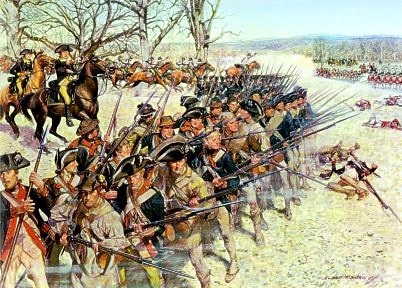 The British won again at Guilford Courthouse (N.C., Mar 1781), but suffered great losses. For the next 2 years, the Carolinas endured a vicious and bloody struggle -- their own civil war -- between the local patriots and the local tories--neighbors, even relatives, but enemies. Sometime in this time frame Thomas Estes/Estridge was captured by the patriots, tried and convicted of treason, and sentenced to hang on Friday, March 1, 1782. Despite Fanning's murderous reputation, Thomas Estridge's neighbors thought he was not worthy of death because he had been more compassionate in his dealings with them. His neighbors petitioned Gov. Thomas Burke to pardon him because he had a wife and several small children. He was pardoned on condition that he immediately join the North Carolina State Militia for one year. 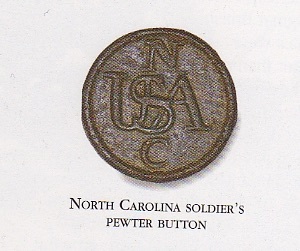 He enlisted Mar 1, 1782 in Jones Company of Col. Abraham Shepard's 10th Regiment of the Continental line for North Carolina as a private, for 12 months. and was killed in battle before his year of service was up. When or where he was killed is not known. After July 1781 the British left the area for the coast and there were no major battles, however, skirmishes between locals continued into 1783 as Col. Fanning's Journal portrays so vividly. Perhaps Thomas had been marked for murder by his former band. Thomas' brother, Moses, however was a patriot soldier, as were many others in the family. Can't you imagine the family strife this caused! The Biographical and Historical Memoirs of Northeast Arkansas, Izard Co. [Page 942] says, "Burris Estes was an officer in the War for Independence, and had in the same army with himself eleven cousins of the same name and some of one father. He drew from the government 600 acres of land, and located his claim in Henry Co., TN, where he passed his last days." [Burris being born in 1765 might have been too young to have actually participated in the fighting]. NC marriage: "Boroughs Estes & Patty Loyd - 26 May 1792"
The story above that Thomas was pardoned partly because he had several small children does not jive with the birthdates I have for these children. In 1782 Patsy would have been 20, Burris 17, Susannah 12, and Elizabeth 5. None were married yet, so maybe "small" is relative. John Estes - Warren Co., Halifax Dist. Lyddle Estes - Stokes Co., Salisbury Dist. John Cheek - Warren Co, Halifax Dist. John Cheek - Anson Co, Fayette Dist. Moses Estes - Pendleton Co. [122 = 1 white male over 16, 2 white males under 16, 2 white females] Since Burris' uncle Moses died in the Rev. War, this census listing could not be for him. In 1800 and 1810 they were supposed to be in Orange Co., N.C.
Burris Estes, Sr. was born in 1765 in North Carolina (probably Orange County). He was named for his mother, Elizabeth Burroughs. On May 26, 1792 in Orange County, NC he married Martha "Patsy" Lloyd, perhaps the daughter of Frederick Lloyd and Mary Lacey. Burris’ uncle, Moses Estes died in the Revolutionary War. 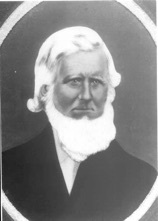 Burris was an administrator of Moses' will, along with his brother-in-law James Cheek, and his cousin Wiley Estes (son of Aaron). In 1827, Burris was on the tax list with 465 acres. In 1828 he was listed as having only 410 acres. Mar 4, 1829, Petitioners Elisha Estes, Aaron Estes, James Estes, dec'd. and his heir James Estes, James Cheek and his wife Martha Estes, John Cheek, dec'd. and his wife Susannah Estes and Josiah Pitman and his wife Elizabeth Estes files suit against Burris Estes for their shares of the 640 acres inherited by Burris' father Thomas Estes, dec'd., from his brother Moses Estes who died in service with no heirs. Jun 10, 1829, Petition not granted and case dismissed. Burris died in the fall of 1829 near Paris, Henry Co, TN. His will, dated Aug. 6, 1829, names his wife Martha, his sons, John, Thomas & Burris Jr., his daughters, Dicy & Delila, and one grandson, William Green. Elizabeth probably had died so her son William Green was mentioned in her stead, but the other daughters were not mentioned by name, though maybe they were to be included in "my daughters." Maybe he left more to Dicy & Delila because they were younger and not married yet. The will is witnessed by James M. Carr, a close friend or relative. Burris Jr. named one of his sons James Karr Estes, and the Karr name was carried down in several generations. On Dec. 7, 1829, Burris' will was contested in court by Joseph Hastings, John Hastings [husband of daughter Anne], William Hastings and William Royall who all said it was not the will of Burris Estes and asked the court to look into it. On March 1, 1830, these 4 men withdrew their complaint, agreed to pay all costs expended on behalf of their complaint, and Burris Estes' will was approved, with Thomas Estes the administrator. State of Tennessee, Henry County: I, Burris Estes, of the State and County aforesaid, being in my proper mind and memory, but low in health. Item. I leave unto my beloved wife Martha Estes during her widow-hood the dwelling house where I now live and ninety acres of land adjoining, household furniture and stock of all kinds, farming tools, and at her death or end of her widowhood my will and desire is that the said ninety acres of land be given to my son John Estes. At the expiration of my wife Martha’s widowhood or death, my will and desire is that all of the stock and moveable property be sold and equally divided amongst my daughters at the death or end of widowhood of my wife, and also the balance of the land on which I now live if any. I give to my son John Estes one roan colt called Jinnes(? ), bridle and saddle. Item. I give and bequeath to my grandson William Green one sorrell Filly and one years schooling and his mother’s part of my property. Item. I give to my daughters Dicy & Delila one feather bed and furniture, one cow and calf each more than my other daughters. Item. I give and bequeath to my son Thomas Estes his equal share of land by deed heretofore rec’d. Item. I give and bequeath to my son Burris Estes his equal share of land by deed heretofore received. Item. If the land lying over on big Harper River ever be got in my possession, my will and desire is that it be equally divided amongst all my children. Beginning at the South West corner of the farm which my house is on, running thence east to the Hazle Hollow branch. Thence down the branch to the lower corner of my barn field. Thence north to the north boundary line for the balance of the complement of the ninety acres of land. Item. My will and desire is that Thomas Estes be my executor and that he should see that my grandson Wm. Green have his years schooling and that my children have their proportion as aforesaid. This my last will and testament and hereby disanul and revoke all others by me made. Signed in presence of James M. Carr and Jesse Burton. The 1830 census is too faint and difficult to read to see their listing. Burris probably died before the 1830 census, but Patsy should be there. Elizabeth Green, Anne Hastings, Hannah Hastings, Patsy Morris, Dicy & Delila. pictured, Thomas Estes (b 1799, son of Burris Sr.), m Millie Cate in NC. son of Burris Estes, Sr. They must have been on the Henry Co, TN census in 1830. He and his 2 brothers moved to Arkansas in 1830. Estes, James K. - 9 Ark. Can't find any of them on the 1860 census. His brother John went to Oregon with Thomas' family in 1853. John Estes was killed by the Indians during the Yakima Indian War of 1856, at Burnt River a few miles above Wallula, Washington, on the Oregon side. In 1861 Thomas moved to Walla Walla, Washington. Burris Jr. was a farmer and died leaving considerable property in land and slaves. He and his wife were members of the Baptist church. Burris died March 1, 1863, Lawrence Co. , Ark. David Spurlock (his son-in-law) was appointed administrator of his will. The case was transferred to Sharp County when Sharp County was created in 1868. Martha died in 1872. Thomas "The Tory" Estes/Estridge Jr.